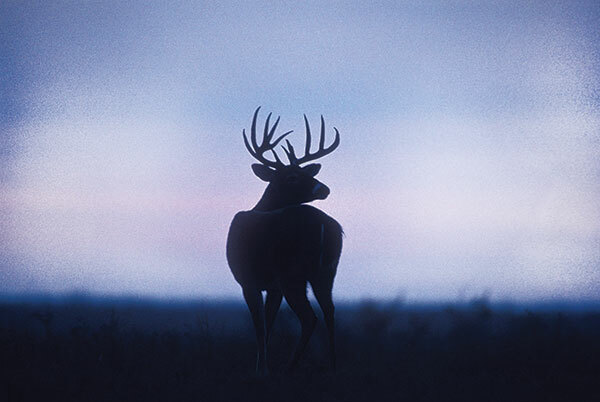 Deer Hunting: Deer at First Light or Last? Adrenaline started coursing through my veins the instant the stupendous buck eased out of the timber. The massive 10-point rack seemed to glow in the fading daylight, and the only thing that kept me from a severe case of buck fever was the fact that my late-season license wouldn’t be good for another three weeks. All I could do was sit and watch through the lens of a camera, which wasn’t all bad. Besides, Iowa’s first gun season would open in five days, and I knew one of my clients would gladly drop the hammer on such a buck. Not wanting to take the slightest chance of disturbing this deer or any of the others feeding in the little bean field, I waited until it was completely dark and then slipped out of the stand on a carefully selected exit trail. I did all of my follow-up scouting with a spotting scope, from a hilltop a half-mile away, and at first light on the morning before gun season opened, I watched the same buck feeding with another that could have been his twin. A perfect setup for the following morning? The field was barely 2-1/2 acres surrounded by timbered ridges with a bedding area in thick cedars 300 yards above. Getting into that hidey-hole in predawn darkness without spooking deer already feeding in the field would be tough. Our normal procedure is to drive a client right to a stand by truck or 4-wheeler, to minimize the spooking factor. It may seem counter intuitive, but deer are far less wary of a motor vehicle than they are of a hunter trying to slip in on foot. However, in such tight quarters, even this seemed iffy, and, in my opinion, not worth the gamble. I waited until early afternoon, when the deer would likely be bedded down, to drive one of my clients to the stand. He later told me that by late afternoon between 20 and 30 deer were in the plot, including a couple of decent bucks, but not the pair I had described. I put this particular client in the stand because he’d hunted with me for years, and I knew he would hold out for one of the boomers. Just before dark, the two wise old bucks moved out of the timber and started feeding with the other deer. My hunter patiently waited until what he judged to be the larger of the pair stood broadside at 90 yards. Only then did he drop the hammer. The symmetrical 10-point rack scored 168 points, typical, with only minor deductions. I’m often asked whether morning or evening hunts are better for trophy whitetails. There are so many variables I would have to say it always depends on the circumstances. But, in general, I lean more toward evening hunts. A number of years ago, I bowhunted Montana’s famed Milk River country where outfitters only hunt in the afternoon, and it didn’t take long to see why. Morning hunts would have been a waste of time, because getting into an effective stand without driving the deer out of the crop fields where they already were congregated would have been almost impossible. Those rivers snake through flat, semi-arid sagebrush, and it’s not practical to farm the oxbows created by the winding waterways. 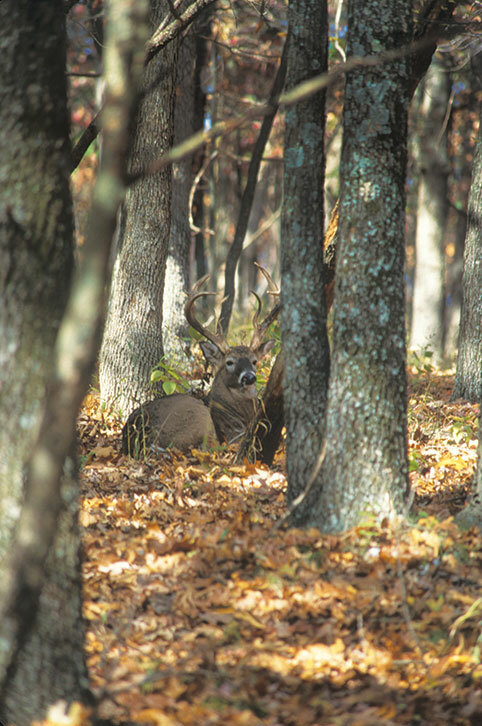 The brush-choked bottoms provide prime bedding areas for both whitetails and muleys. The thickets are all but impenetrable, and the only effective way to hunt those deer is from stands overlooking the nearby crop fields, and the only time to take those stands is during the day when the deer are bedded in the thickets. Then hunters patiently wait for evening, when the big deer move out into the open to feed. It’s the textbook example of why evening hunting can be more productive. That being said, some places it is more productive to rattle and grunt call in the morning. I believe this is due to the fact that even after a night of feeding and frolic, rut-minded bucks still respond to calling as they work their way toward bed, perhaps looking to steal one last doe from a rival and usher her into the bedding area. In the evening, as these same deer leave the bedding areas, they tend to be more cautious, at least until the daylight fades. I’ve rattled and grunt called to countless bucks in the late afternoon, got their attention, but couldn’t pull them a step closer. This is more the case with rattling than grunt calling, and on occasion, I may still try subtle grunt calling in the evening, figuring nothing ventured, nothing gained. The more you understand the overall situation, the likelier you will be to hunt smart. One of the keys to success on our Iowa leases is that I and my guides continue to scout other areas while our hunters are on stand. A couple of years ago, I spent a morning glassing a vast field with a small patch of standing corn in one corner. After watching several small bucks and a doe move through the field into bordering timber, I was about to leave when a huge buck followed a doe out into the field and began nonchalantly feeding. It was broad daylight, maybe 10 o’clock. I had never seen this buck before and believe it followed the doe off of a neighboring property. The pair stayed in the field half an hour before slipping back into the timber. Two o’clock that afternoon, I drove a hyped hunter and his son, who had tagged-out the previous evening, directly to that blind. Less than a minute later, I was out of there, driving straight across the open field, staying away from the edge of timber in case the big buck and his cohort were bedded nearby. At 5 p.m., the buck emerged from the timber, this time alone. When he had moved within 120 yards of the blind, the hunter centered the crosshair and took a shot that dropped the deer of a lifetime. The massive rack sported 11 tines and scored 196 Boone & Crockett points. Even when hunting on my own, I often spend a morning scouting with binoculars or sitting behind a spotting scope. When rutting bucks are running the countryside, you never know what you might see. Some of the nicest bucks in my den were located this way and taken later in the afternoon. I think hunters miss a bet by not continuing to scout during the season, utilizing mornings to monitor the hunting area and hopefully pinpoint the travel patterns of a special buck. Yes, it may be better to sit tight in a stand while actually hunting. After all, it is about impossible to walk up on a mature whitetail buck. But that doesn’t mean you have to sit there all day, silently hoping for the best. Some stands are good morning or evening. We have several such stands on the ridges between crop fields and timbered sanctuary areas, and it’s interesting to note the difference in morning and evening deer travel. From just after daylight to mid morning, there may be a constant flow of deer filtering past, returning to bed in the timber. Come evening, the movement is reversed and more concentrated, with deer waiting until close to dark to begin moving more rapidly from bedding to feeding areas. Patterning this movement, and then hunting accordingly, has made a big difference in our success rate. As the season progresses and deer adapt to hunting pressure, I tend to favor evening hunts even more. While mature bucks may be more reclusive than they were before the rut, and less active than they were during the rut, they also are interested in filling their bellies, and food can be harder to locate late in the year, especially for a deer that has been pressured out of its normal home range. That, in turn, can make said deer easier to pattern. Find the food, find the deer. But this is a time to choose stands with great care and then hunt with as much finesse as you can muster, and one of the most important considerations is getting into and out of the stand without being detected. You will likely only get one shot at a skittish, pressured buck. If you arouse his suspicions in the slightest, he will leave the area. While most hunters make an effort to get into a stand without making too much of a commotion, few realize that it may be even more important to get back out with minimal disturbance, especially in the darkening evening with deer all around. When hunting an evening stand, especially over a feeding area, I always pack a couple of coyote howlers. At the end of the day, especially if I know deer are around, I cut loose with a couple of loud howls followed by some excited barking and yipping. I can almost guarantee that any deer in the vicinity will take a powder. Then, I can quietly sneak out in the dark without alerting the deer to my human presence. At the end of last season, after all of our clients had filled their tags, I had a chance to hunt for myself, and my choice was a blind situated across a beaver-choked creek bottom from an open feeding field. I and my guide and soon-to-be-partner Sheri had been glassing the field from afar and had seen several good bucks, including a monster we both estimated would score in the high 190s. It was definitely an evening stand, and while glassing the field at daylight the morning of my hunt, I watched 40 deer leave the plot. A northwest wind was perfect for the location, always a key consideration. Sheri taxied me to the stand at noon. If she hadn’t been there, I probably would have driven myself in and covered the snowmobile with camo netting. Works like a charm, and the colder and more miserable the weather, the more forgiving the deer seem to be. Whitetails started drifting into the plot soon after Sheri drove away, and at one point, I counted 51 scattered in the soybeans and on a far hillside. I didn’t see the monster buck, but a particular 10-pointer caught my eye. He carried one of the cleanest typical racks I had seen, with long tines and decent mass. Didn’t have a great spread (I know, picky, picky, picky), but I estimated it still might score 170. I watched that buck for half an hour before deciding that with less than an hour of shooting light left, I’d be stupid to pass on such a deer while waiting for a phantom that might never appear. A rangefinder showed the buck at 146 yards, angling slightly toward me. I centered the crosshair high on a shoulder and put the final pressure on the trigger. Three Hodgdon White Hot pellets launched 250 grains of Barnes TMZ boattail bullet, and when the smoke cleared, the buck was lying right where he had been standing seconds before. The rack scored 169 typical. What a way to end the season.